How the Schengen area was created Jump to media player The Schengen Agreement was implemented in 1995 and it allows freedom of movement between the countries which are signed up to it. Migrants in Hungary: Chaos and confusion Jump to media player The flow of migrants trying to reach Europe to escape war zones in the Middle East and poverty and turmoil in Africa shows no signs of easing. Migrants on the move across Europe Jump to media player Migrants have begun arriving at Munich train station after crossing into Europe through Hungary. Hollande: 'We have not done enough' Jump to media player French President Francois Hollande has said Europe has not done enough to tackle the migrant crisis. The Schengen Agreement was implemented in 1985 and it allows freedom of movement between the countries which are signed up to it. Initially not many countries were in the agreement but it now includes almost every country in the European Union. 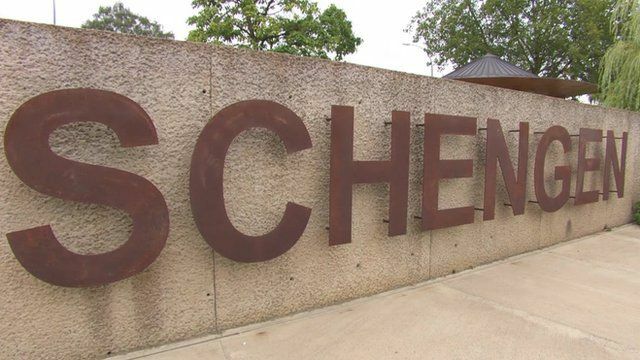 Chris Morris reports from Schengen in Luxembourg on how the agreement came to be.